Feast of Fields, a 4 hour wandering harvest festival, is our annual fundraising event. With a wine glass and linen napkin in hand, you can taste the very best of BC from chefs, farmers, fishers, ranchers, food artisans like Made Here Okanagan!, vintners, brewers, distillers and other beverage producers from across the province. Feast of Fields highlights the connections between farmer and chef, field and table, and farm folks and city folks. Feast of Fields is a gastronomic journey towards a sustainable, local food system. Come celebrate with us! Grill Peaches this summer with Balsamic Bliss…..
Super easy to do this summer, and delicious! Slice peaches in half and remove pit. 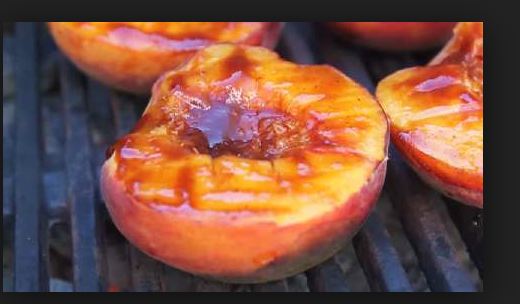 On a warm BBQ quickly sear top and flip over so the skin side is down.Fill the hole where the pit was with Balsamic Bliss ( my favorite for peaches is the Hot Habanero Balsamic Bliss) and watch carefully as the bubbles start to rise and the peach begins to caramelize. Slide off after four or five minutes and serve with Vanilla Bean ice cream ( or your fav flavour). Your guests will be wanting seconds….yay! Our Balsamic, matured with time honoured techniques of barrel aging, is then infused with “just picked” Okanagan organic sun- kissed orange Habanero Peppers to create a thick, rich full bodied Balsamic that is best described as simply Bliss! Smooth, with a sweet heat, and NO ADDED SUGAR, this velvety Balsamic is about to be your most prized condiment. 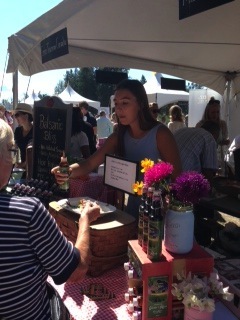 Handcrafted in small batches for premium freshness and flavour, Balsamic Bliss with Okanagan grown Habanero Peppers is the perfect elixir for drizzling on baby greens, fresh vegetables like avocados and tomatoes, goat cheese and basil, bruschetta, gourmet pizza, seared salmon or tuna, roasted chicken or burgers and Portobello mushrooms just off the BBQ. Each bottle of our amazing sweet heat nectar is a celebration of those blissful Okanagan summers in the orchards. Enjoy Balsamic Bliss as you would a fine wine. Our Balsamic, matured with time honoured techniques of barrel aging, is then infused with “just picked” Okanagan organic garlic and sun-kissed herbs like Rosemary, Basil and Oregano, to create a thick, rich, full bodied Balsamic that is best described as simply Bliss! Smooth and sweet, with NO ADDED SUGAR, this velvety Balsamic is about to be your most prized condiment. Handcrafted in small batches for premium freshness and flavour, Balsamic Bliss with Okanagan grown premium garlic and fresh handpicked herbs is the perfect accompaniment to spinach, romaine, arugula and baby greens with shaved parmesan cheese, fresh heirloom tomatoes and basil, prosciutto, caprese salad, gourmet pizza, BBQ salmon , roasted chicken or just picked peaches. This amazing nectar is a celebration of those blissful Okanagan summers in the orchards. Enjoy Balsamic Bliss as you would a fine wine. 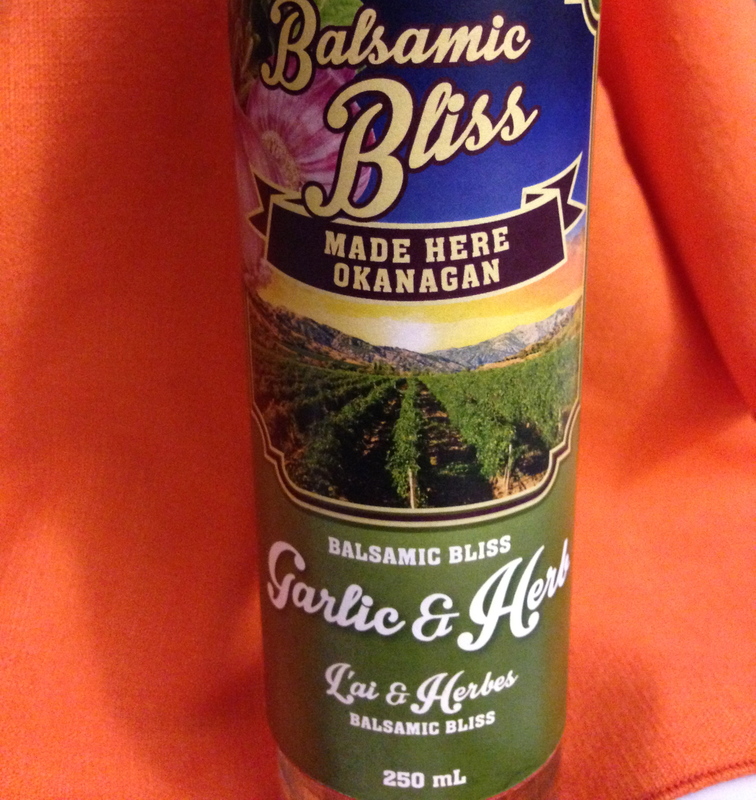 This entry was tagged Balsamic, Balsamic Bliss, Farmer's Market, Garlic & Herb, Hot Habanero, Made Here Okanagan, No Sugar Added. Bookmark the permalink. 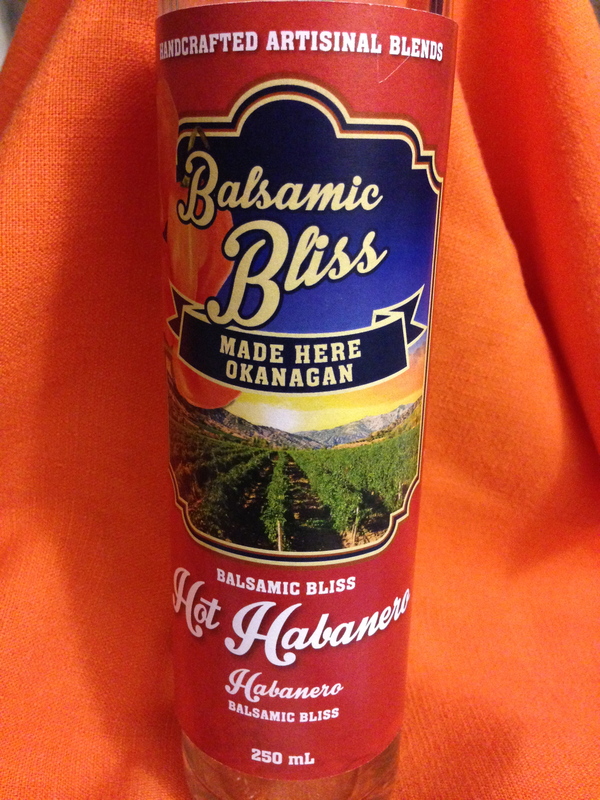 I was out in Penticton visiting family in June and I picked up some of your delicious ‘Hot Habanero- Balsamic Bliss’ at the Farmers Market. I was wondering if you sold your product out in Toronto or was willing to ship? We just can’t get enough of it, use it as dressing on all our salads 🙂 Would appreciate any feedback! Thanks for the email and Im thrilled you are loving my Balsamic Bliss and need more. Currently Balsamic Bliss is only available in the Okanagan (some day the rest of Canada :)) However I would be happy to ship a bottle your way! Thanks for supporting Canadian artisans and have a wonderful summer! Hi there! I found your website in search of ordering more of the Hot Habanero Balsamic Bliss.. I accidentally shattered the remaining half of my mom’s bottle, and broke her heart in the process she loves this stuff so much! Is it possible to order a couple more bottles? Good News Camille! Please visit our new Where To Buy Page for retail partners in VANCOUVER! I am so in love with your Balsamic Bliss Bliss Hot Habanero! I live in Burnaby and NEED MORE! HELP!!!! Where can I buy it or order it from??? Just send me your address and I can start the shipping process. I dont want you to wait a single second longer!